Wash, Exfoliate, and Moisturize—seems like a no-brainer, right? You’d be surprised how often these essential steps are overlooked! I’m just as guilty over here; before my beauty regiment only focused on my face and ignored the rest of my body thinking it would care for itself. After educating myself further, I started implementing a few techniques that improved my entire body’s complexion considerably, achieving the skin of my dreams. Below is my body scrubbing routine for better and brighter looking skin instantly! I live in New York City, one of the most polluted places in the United States! Even shortly after leaving my apartment clean, the concrete jungle’s sidewalks and subways make me want to shower again. 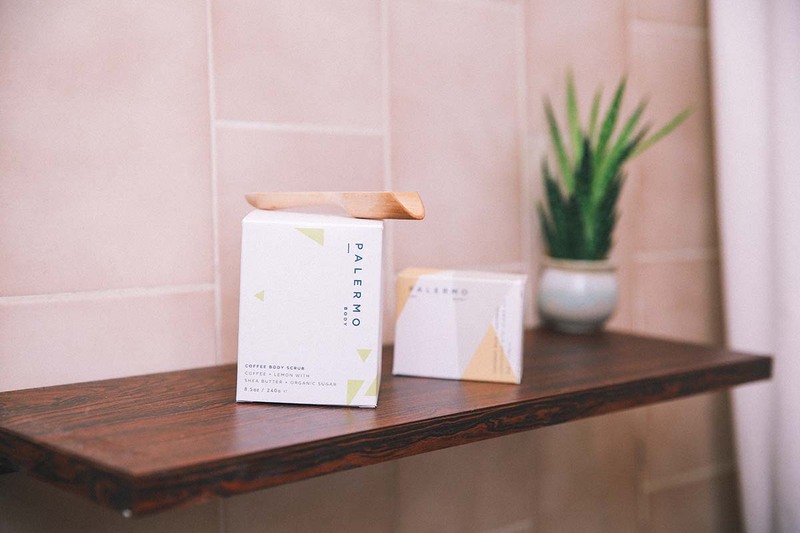 Removing dirt particles from trudging around all day with a gentle bar soap, like the Palermo Body is key for me. This guy gets the job done and is ideal for sensitive or dry skin. Plus it contains moisturizing coconut milk and firming oatmeal [that’s gluten-free]! I love my coffee in the morning as much as I love scrubbing with it at night! Coffee is full of antioxidants that help to bolster natural defenses (like cell re-growth). 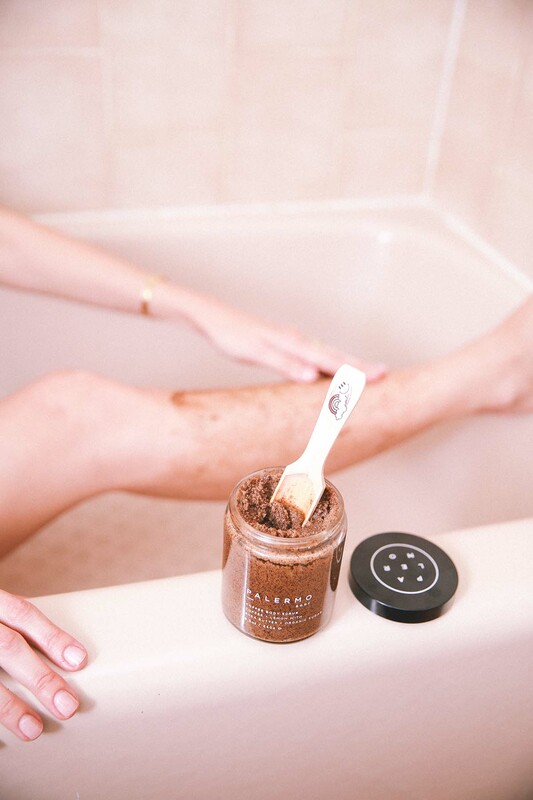 This Palermo Body scrub is made with organic fair trade coffee + raw sugar polish that exfoliates and energizes your skin. It leaves your skin feeling moisturized and clean, must be the shea butter + coconut oil with a hint of lemon. Pro tip: Using a wooden scooper leaves less of a mess! Now that your skin is all clean and smooth, it is time to lock in some moisture. One of the most important things in this routine is to get water back into your skin. Take a few pumps of the Palermo Body hydrating oil [ a little goes a long way] and apply to the body. For best results, use right after taking a shower when your skin is still dewy. The blend of moisturizing botanical oils is formulated to revitalize your skin and make it smell wonderful! 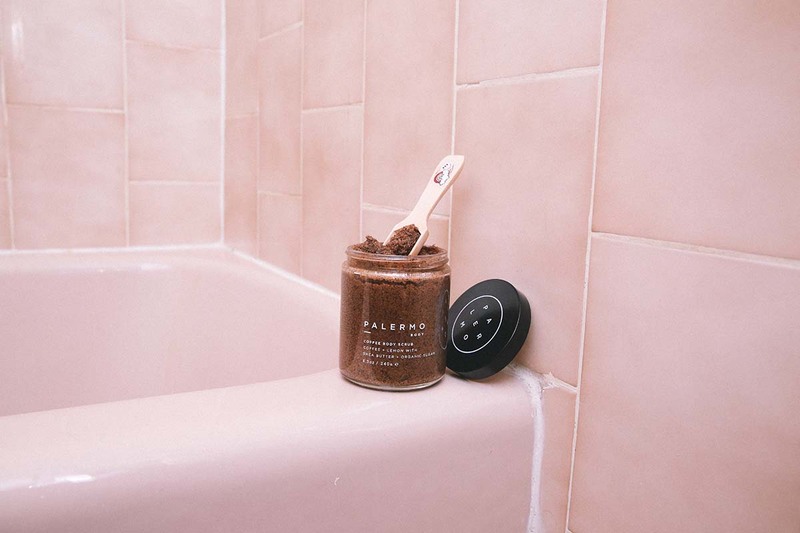 Big thank you to PALERMO Body for partnering with me on this post to showcase their bath + body products. You can shop the goodies HERE! As always, opinions and thoughts expressed are solely my own. This is so lovely, Ana! Thank you for sharing your honest review of our products. We’re so glad to be a part of your self care rituals. I’m getting into self care and looking for new products. Thank you for the tips! I love a good scrub and this one looks amazing. Thanks for sharing, i’ll definitely have to try it out! Exfoliating my skin is a must. But, like you, I sometimes forget. A lot. Gotta do better. Love your review on these products. Definitely will try it! Ahhh that scrub looks amazing!! I’ll have to try it out 🙂 Thanks for sharing! At first I thought this was a product of Oliva Palermo!! I will have to try this! Love this post, very intimate and chic. I cannot do coffee scrubs, the oily feeling in the tub under my feet after my bath drives me nuts, but they feel so great on the skin! Thank you so much for sharing! I need to try your routine! © Copyright 2019. Ana Prodanovich. All Rights Reserved.